HONT is one of the most reliable barrier terminal block manufacturers in China. Its barrier terminal block enjoys high reputation on the market. Because of its superior quality and high level service. People from all over the world come and buy the product from HONT. Material: Made from PA, PE OR PP. HONT is your reliable barrier terminal block manufacturer. It has rich experience in this industry. Established in 1996, HONT specializes in the research, development, production and sales of terminals. It can provide a series of perfect terminal connection solutions for industry partners. It has international advanced die design and manufacturing technology. And at the same time, the company owns a huge team from product development, die design and development, product production and quality assurance system. The products are of various types and thousands of specifications. The company has passed ISO 9001:2000 quality system certification. And we also have CE safety certification and UL certification. It conforms to RoHS environmental protection standard. Our barrier terminal block is widely used in power, electronics, telecommunications, transportation, factory automation and many other fields. With the developed steps of the society, the company makes full use of Zhejiang’s talent and logistics plateau to improve the technical content of products. And we are reducing the cost of products. In product development, marketing, quality management and customer service, we are devoting ourselves. The customers of HONT are all over the world. Some are from America. Some of the customers are from Australia. Some the clients are the German. They are all around almost 200 countries and cities. It is thanks to the high contribution of the company, barrier terminal block manufacturer. It has a high reputation and credit in the hearts of these customers and clients. The company strives to improve in many ways to increase the strength and competitiveness of the enterprise. We continuously improve our products and services. And we have offices throughout the country, products are exported to the international market. Focus on customers, strive to satisfy customers’highest requirements with satisfactory quality. At the same time, HONT, the barrier terminal block manufacturer innovates technology, complete varieties, reasonable suggestions and services. Welcome users to contact HONT, the barrier terminal block manufacturer. We are willing to share the profits and quality of technology in the principle of win-win sharing. What is the barrier terminal block? Someone may ask some questions. What is barrier terminal block used for? And what the main function of them? The barrier terminal block manufacturers decide to produce these products. They must have seen the function and demands of them. These products are used for the convenience of the wiring connection. In fact, it is a piece of metal sheet. And this metal sheet is not exposed in the air directly. It is sealed in the plastic. And this plastic is with the function of insulation. Both of the ends of the metal sheet have a hole. And the hole can be inserted into the wires. And we can make it tight with the screws. Or we can also use the screws to make it loose. When we have two wires. And we may need the two wires connected sometimes. Sometimes, we may want to separate the wires. We could use the barrier terminal block to connect wires. And we can also use it to separate. No matter the connection or separation of wires, this product can easily finish it. We don’t need to weld the wires. And we can separate whenever we want. It is very convenient. It is used to help the connection of wires. It is actually a piece of metal enclosed in insulating plastic. There are holes at both ends to put into wires. There are screws for tightening or loosening on the terminal strips. For example, two wires. Sometimes they need to be connected. And sometimes they need to be disconnected on the row barrier. At this time, they can be connected by barrier terminal block. And they can be disconnected at any time without having to disconnect them. It’s easy and fast to weld or twist together for this phoenix contact. And it is suitable for a large number of wires interconnection. In the power industry there are special terminal row, terminal box, above all are wiring terminals, single row, double-layer, printed circuit, voltage, ordinary, breakable and so on. A certain area of crimping is used to ensure reliable contact and sufficient current. Barrier terminal block is an electrical connector. It is divided into connectors in industry. The industrial automation degree is increasing. And the requirements for the industrial control is more and more higher. So the use of barrier terminal block is increasing. And there are more and more types of terminal blocks. Now, besides PCB board terminals, there are also hardware terminals, nut terminals, spring terminals, screw terminals and so on. There are so many classifications on the market. Now let us have ideas of some types below. Plug terminal blocks consists of two parts connected by plug-and-pull. One part is tightened and then put into the other part. It is welded to the PCB board. This connection is based on the mechanical principle of the bottom. The anti-vibration design ensures the long-term airtight connection of the product. And it ensures the reliability of the product. The two ends of the socket can be fitted with assembling ears. The ears can protect the patches to a great extent. And it stops the patches from being poorly arranged. At the same time, the design of the socket can ensure that the socket can be put into the parent body correctly. The socket can also have assembly and locking fasteners. The assembly fastener can be more firmly fixed to the PCB board. And the locking fastener can lock the parent and socket after the installation is finished. Different socket designs can be matched with different parent insertion methods. For example horizontal, vertical or inclined PCB, according to customer requirements. They can choose different ways. This kind of terminal block is the most popular terminal type in the market. It can choose either metric or standard line gauge. It can achieve safe, reliable and effective connection, especially in the high current and high voltage environment. It is a new type of barrier terminal block. It is using spring device. This kind of barrier terminal block has been widely used in the world’s electrical and electronic engineering industry. For example lighting, elevator lift control, instrument, power supply, chemical and automotive power industry, etc. It adopts reliable threaded connection technology. And it uses electronic fusing technology and the latest electrical connection technology. This kind of type is widely used in power electronics, communications, electrical control and power supply fields. This type uses screw connection technology. Its insulation material is PA 66 (flame retardant grade: UL 94 V-0). 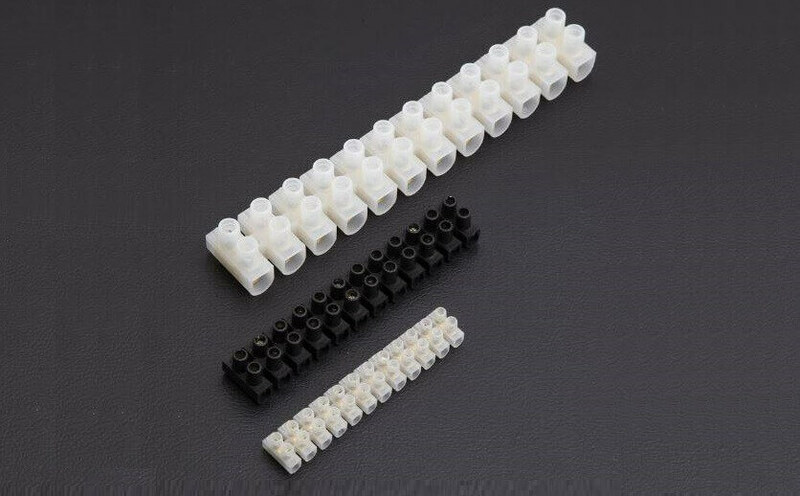 And the connector is made of high quality conductive metal material. H-type wall-piercing terminal block. It can can be installed side-by-side on the same thickness panel of 1 mm to 10 mm. They can compensate the distance of adjusting the thickness of the panel. It forms arbitrary number of terminals. It can use the isolation board to increase the air gap and distance. Without any tools, the wall-piercing terminal can be firmly installed in the rectangular reserved hole on the panel. It is easy to install. H-type wall-piercing terminal is widely used in some places. They are requiring wall-piercing. For example, power supply, filter, electrical control cabinet and other electronic equipment. It has good insulation performance and high protection level. The users can work directly after external wiring. And it reduces many unnecessary wiring steps. The color is gray. And it can be installed on U-shaped or G-shaped rail. Double-layer terminal has twice the connection capacity of universal terminal in the same position. The upper and lower layers are separated by 2.5 mm space in design. It is clear. And in the case of upper layer connection, screwdriver can work easy in the lower layer area with clear identification. As a kind of connector, Barrier terminal block is an important component in the industry. It plays an important role. Because engineers begin with the test. That is when they are overhauling, the design of terminal block is particularly important. The design of the product is a difficult design. It includes product standard, material, structure, electroplating, certification, die and manufacturing process. So the barrier terminal block is no exception. Product standards play a general guiding ideology. Almost all things are based on it. Our terminal block made by the barrier terminal block manufacturer. Its design standards are based on UL and CSA first. But some electrical parameters can also be based on other standards. For example high and low temperature tests. Material choosing directly affects the whole product. And is the key to design. Take plastic as an example. If the flame retardant of UL94 V-0 is taken as the design basis. It is needed to carefully examine whether the technical parameters of materials can meet the product standards. For example, whether the impact voltage and aging test can pass or not. In hardware material, the choice of the main compression material of TP is very important. Because this pressing sheet needs to satisfy certain conductivity (current). And it has certain elasticity. It brings difficulties to our engineers in choosing materials. It is precisely the trend pursued by barrier terminal block suppliers in elastic components. Many barrier terminal block factories of hardware materials are making efforts in this. Conductivity directly affects temperature rise. And it also affects contact resistance, elasticity and materials. The chemical elements, elastic modulus, hardness and tensile strength are related. The elastic modulus is calculated by the fourth strength theoretical formula of material mechanics. The larger the conductivity of the material, the smaller the temperature rise, the lower the contact resistance. The relationship between the plugging force and the contact resistance is quadratic. The contact resistance mainly includes compression resistance, film resistance and volume resistance. Among them, the film resistance accounts for 70-80% of the total resistance. It is also the main factor affecting the life of the connector. Full attention should be paid to it. Compared with gold plating and silver plating, silver plating has higher conductivity than gold plating. But its chemical stability is not as good as gold plating. The film resistance caused by silver plating is far greater than that by gold plating. The design of product structure is also very important. There is no shortcut to go. Each series has its own uses. For example, screw protection, arc-shaped stitching products. And it also includes long-digit deformation, shrinkage deformation caused by uneven wall thickness, and so on. The screw protection mainly includes the following: three-bar protection, hoop protection, neck protection, stamping prevention. Because of the influence of technical process, the neck is not widely used. But most of them are neck. The above structure is based on plastic material as the precondition of PA 66. Here, we need to explain neck prevention. Take screw as M 3 for example, the actual external diameter of the screw in M 3 is 2.90 mm. So the size of the neck of the shell should be designed in the range of 2.5-2.6. And the thickness of the neck of the shell should be 0.4-0.5 mm. And under the head of the screw should be a light rod smaller than the neck of the shell. So it can ensure that the screw can be smoothly screwed into the thread. The production process should also be adjusted .